43/44" Wide 100% Cotton. 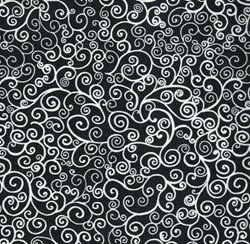 Tonal swirls. Machine wash/Tumble dry. Price is per yard. Image shows white on black, but this fabric is black on white. 43/44" Wide 100% Cotton. Great black & white to add to your stash! Machine Wash/Tumble Dry. Price is per yard.